Northern Michigan's golf reputation is well known. But Traverse City is also a cultural hotbed in the summertime, hosting a variety of wineries and also a nationally recognized film festival each summer. Traverse City is northern Michigan's summer hotbed with events such as the Traverse City Film Fest. 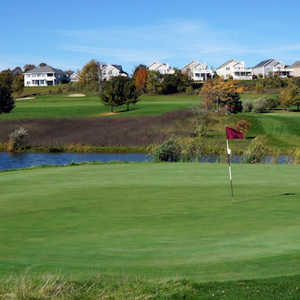 TRAVERSE CITY, Mich -- Let's say you're a links lover, oenophile and movie buff. Where would you go to get your fill of all three? Napa seems the logical choice. The golf isn't great, but it's good, what with Chardonnay Golf Club and Silverado Resort among the options. It's clearly the Vino Capital of America. And starting November 2011, it's home to a film festival. But until then, only one destination in North America fits the bill: Traverse City, in northern Michigan. That's right: A state with one of the coolest economies in the nation is also a hotbed for killer courses, award-winning wine and -- during the last week of July, at least -- the best in new-world cinema. It's not much of a secret anymore, either. Locals say the Traverse City Film Festival -- an annual event founded in 2005 by Oscar-winning filmmaker and proud Michigander Michael Moore -- is the premier pull in summer, drawing more tourists than even the National Cherry Festival in early July or Detroit Red Wings Training Camp in mid September. "You can take my word that you can literally throw 10 darts at the (film) schedule, and, no matter where they land, you will have just programmed yourself one of the best weeks you've ever had in northern Michigan," said Moore. During the film fest, the most common nocturnal sight along Traverse City's historic Front Street is ticket holders lined up outside storied State Theatre, waiting to score a prime seat for the day's featured screening. Ice cream parlors, restaurants and bars swell with customers, too. The lakeside town buzzes with Sundance-like energy. "We get a lot of people that pop in just to get away from that scene for a little while," said Kristy McClellan, events manager at Bowers Harbor Vineyard. "But most of our crowds come for the wine itself." If eight isn't enough, there are 19 more tasting rooms along Leelanau Peninsula, which forms the other geographical horn above Traverse City. A secondary sipping spot? Not even. Just ask celebrity chef Mario Batali, who now calls this ribbon of rolling, grapevine-covered hills his summertime residence. Not surprisingly, Batali digs the area's farmers' markets and local whitefish most. But if golf were his greatest passion, he'd still be a Traverse City regular. As any golf enthusiast knows, northern Michigan boasts more courses than you can shake a sand wedge at. And while dozens are worth playing, there can only be one perfect pairing. Kingsley Club undoubtedly belongs in that twosome. Sure, it's a bear to get on -- the club is currently offering limited promotional play to non-members -- but it's worth every effort. And then it's a bear to locate; this lost soul had to call the pro shop to make sure the turn I'd made onto a two-track road leading through the woods was indeed the right move. But as a woman in the pro shop said the day I visited, "If you can't find it, you don't want it bad enough." 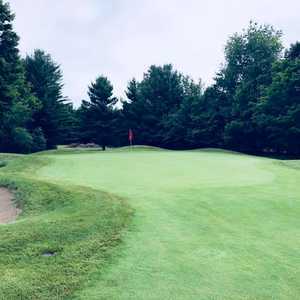 The reward is an experience similar to ones found at Prairie Dunes or Boston Golf Club, golf-only venues with rugged, links-style courses set amongst towering trees. Kingsley Club opened in 2001 but could pass for being a century old. Even its modest clubhouse evokes those of a bygone era. By contrast, the gathering hall at Forest Dunes Golf Club (about 70 miles east of Traverse City in Roscommon) is as grand and as elegant as they come -- a 15,000-square-foot facility made of stone and cedar shake siding so as to blend into the wooded landscape near the town of Roscommon. But as at Kingsley Club, golf is the main attraction here. Managed by Troon Golf, the Tom Weiskopf design artfully weaves its way through Huron National Park's diverse patches of wilderness. It goes into the trees, back out into the open, then through the thicket again before baring all once more. In other words, playing Forest Dunes is kind of like watching a good flick -- with each passing minute, the plot thickens and the anticipation builds. And, of course, the end comes way too quickly. Formerly managing editor of Golf Connoisseur and editor-in-chief of Luxury Golf & Travel, Scott Resch now writes only when he gets a wild hair. The Park City, Utah, resident spends most of his time generating editorial coverage for Mandarin Media's overseas golf course and hotel clients and over-thinking his golf swing.